Parents packed Rowland High on Aug. 27 to hear an update on a new swimming pool. The old pool was closed in May of 2011 after school officials discovered bad water leaks. So the community has sorely missed the recreational facility for more than two years. District officials say they will look at contractors’ proposals in September and award the best bid at the Oct. 8 school board meeting. Concerned community members questioned why it has taken so long to get the construction project under way. They pointed out that the district had approved a project budget in July of 2012. Rowland’s Director of Facilities Stuart Moe said the state can take up to a year to review construction plans and approve them. “This was pretty fast for a project of this size,” Moe commented. Need some homework help? Maybe your computer crashed and you can’t get on the Internet? No problem, the community library at Nogales High School has got you covered. The glistening new library on the Rowland Unified campus is ready to serve residents. As part of the $8 million high school renovation, the old library had been stripped down to the brick walls. Contractors rebuilt it with the latest technology. At 3 p.m., the high school library becomes a remarkable resource for the entire community. Public hours are from 3 to 7 p.m weekdays. The community library serves La Puente, West Covina, Rowland Heights, Walnut and Industry. It has been open for the past 9 years. Anyone can get a library card. Adults should bring a photo ID with their current address, plus another proof of residence such as a utility bill or cable bill. Children sponsored by their parent or guardian don’t need an ID to get a library card. Unleash your inner fair during Diamond Bar Day at the LA County Fair on Sept. 5. Come meet our community heros and then enjoy the fair. Advance online purchase is only $5. Proceeds will benefit the Big Yellow Bus program. purchased online in advance. $5 offer not available at Fair gates. Not valid with any other offers. No cash value. Each meeting provides updates from the Sheriff and California Highway Patrol, Congressman Royce’s Office, Supervisor Knabe’s local office and other representatives of local governing agencies. 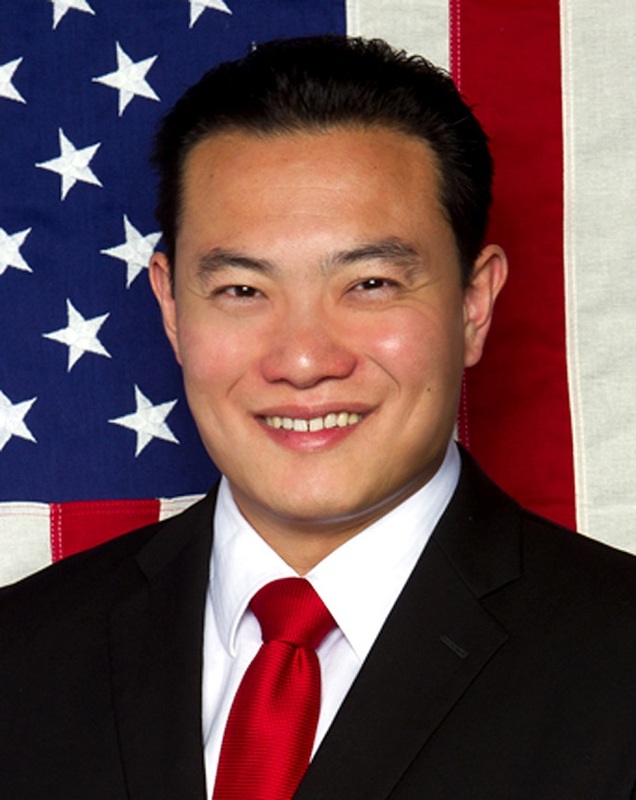 Walnut Valley Unified School Board Member Phillip Chen will announce his intention to run for State Assembly this morning at 11 a.m. in the Seafood Village Restaurant in Rowland Heights. Chen is running in the 55th Assembly district currently represented by Assemblyman Curt Hagman, who is not running for reelection due to term limits. The Republican school board member is reporting $334,000 raised through June 30, and $319,000 cash on hand in his newly formed Assembly committee. Chen is a small business owner and USC professor who was the top vote-getter in the Walnut Valley Unified School District Board election in November 2011. He is an adviser on health care issues to Supervisor Mike Antonovich and a reserve Deputy Sheriff for the L.A. County Sheriff’s Department. Celebrate National Night Out and Movies Under the Stars in Diamond Bar tonight. Music fills the night air on Wednesday evenings in Sycamore Park. 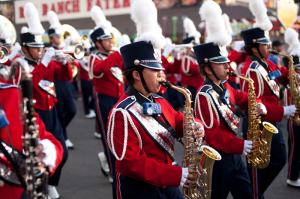 Concerts begin at 6:30 p.m. Free parking and handicapped accessible shuttle service is available at the Diamond Bar Golf Course and Sycamore Canyon Park, beginning at 5:30 p.m. Dogs, and other pets, with the exception of registered assistance guide dogs are discouraged due to safety issues and expected large crowd and loud noise conditions. Join Walnut residents for National Night Out and Concert in the Park tonight, beginning at 6:30 p.m. in Creekside Park. This annual event reminds the Walnut community how we can prevent crime through neighborhood involvement. This citywide get-together is an opportunity for residents of Walnut to meet the Mayor and City Council, as well as people from the Walnut/Diamond Bar Sheriff’s Station. The band, The Answer, will perform classic rock. Food trucks will sell meals, snacks and other refreshments. Join the Rowland Water District for the big National Night Out event at Carolyn Rosas Park at 18500 Farjardo St. in Rowland Heights from 6 to 8 p.m. tonight. Come spend the evening getting to know your local law enforcement and public service departments. There will be free hot dogs, chips, drinks and entertainment. Free prizes and goodies will also be given out to the kids. Robert Pacheco, who began his political career in local government and went on to serve six years in the state Assembly, is returning to Walnut City Council. The 79-year-old Latino Republican stood out among an impressive field of 10 candidates, winning the appointment by a 3-0-1 vote of the Walnut City Council Wednesday night. 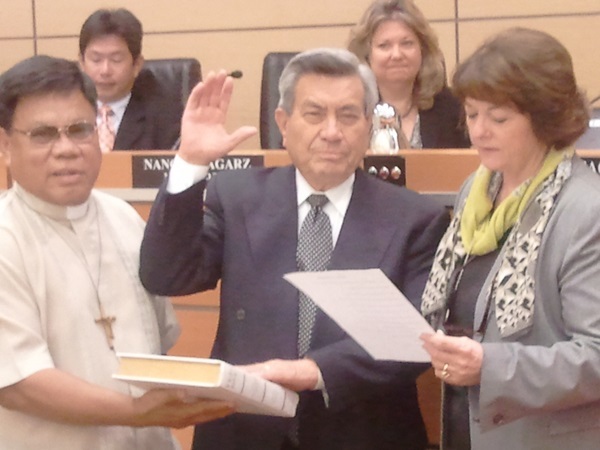 Pacheco served two years on the City Council in the 1990s. He was elected to the Assembly in 1998 where he served until 2004, the only person from Walnut ever elected to state office. “I am going to bring new blood to the City Council. Oh, on the other hand, it is refurbished blood,” Pacheco said in a light moment after taking the oath of office administered by his wife, Gayle, and the Rev. Tony P. Astudillo of St. Lorenzo Ruiz Catholic Church in Walnut. Pacheco will fill the seat of long-time council member Thomas King, who moved to Orange County. He will occupy the unexpired council term until April 2014, at which time he said he will run for a full, four-year term. “Yes, that is the plan,” he said. Pacheco received support from Mayor Tony Cartagena and council members Mary Su and Nancy Tragarz. Councilman Eric Ching abstained. Ching nominated Howard S. Chang, who ran for City Council in 2010 and lost. Read more in Steve Scauzillo’s story PACHECO.